These are my notes from the “Key Ingredients for Blended Learning” session at the 2016 FETC conference. Taught 2nd grade, then took job with Apple after iPad came out. Started a high school titled “Learning without Limits” in Ohio. Success is not a straight line, it is a squiggly path. Great full color Blended Learning Cookbook handout. Screen has mnemonic for password: urban figs part doubtful mice. Like Nearpod, but presenter says this one is way better. Slide had map of US, have students drag hearts, stars, and flags about places where you were born, currently live, or would like to visit. Insert how miles from here you were born, which creates a graph. Multiple choice: what subject do you teach, which creates a realtime graph, used for group creation. My group – has used blended learning before. Two grids sets of 4 squares, we discussed two questions and filled out the grids. 2nd rotation: in packet, read page 1 and then fill out chart on page 10. 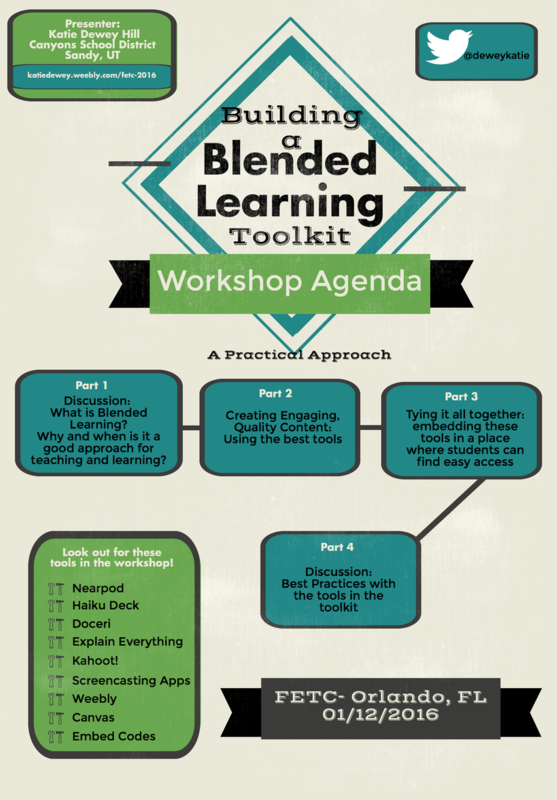 What is blended learning? : students work at their own pace, work in separate places, and are grouped using data. What blended learning is not: students in rows, all doing busy work. 3rd rotation: go to Blended Learning Cookbook.com and watch the videos. Videos are created using Zaption. Picture on screen shows a grid of student jobs. Unlink “blended learning rotations”, this time there is no timer. Had participants sort ourselves by tech savyness. We got to pick a topic to work on, so I looked at Peardeck. I was very disappointed in how expensive it was, and it seems very limited. It flattened PowerPoints as images. Coolest features were really expensive. I then looked at Nearpod and it worked much better. She recommends Educannon and Zaption, which allow you to add questions to YouTube to stop students at key points in the video to answer questions. Go Formative, looks like another way to collect data from students. During tech projects, she has designated students run a Genius Bar to help other students. Power My Learning – federal program for finding projects. No Red Ink – help students with grammar. Quizizz, like Kahoot, but students go at their own pace. It ranks students as they answer questions and they watch their avatar move up and down. These are my notes from the “Build your Grant Writing Toolkit” session at the 2016 FETC conference. Grant writing is the same as fiction writing. Elevator pitch – short abstract of the proposal. Don’t write just an equipment list. Think about what is going to change. Students will use mobile technology as a daily part of their education. Teachers will take advantage of the equipment to not only augment the learning, but also to transform the way that students learn. Students would have a high enough access to technology that obtaining devices for a lesson or project poses an insignificant obstacle to the teacher. Technology would be accessible in a manner that students can pull out devices on short notice. Find a critical friend to help edit. Work with community partners, such as a local business that will provide food during meetings. Find research to support your dream. Check in with principal or district office. Think about indirect costs. There may be requirements to include this. You might be able to find an organization that will match costs. What is unique about your population? Get photos of the reality that needs to change. You might need to do the math to convert raw numbers to percentages. If demographic numbers are atypical for a particular year, it should be explained within the grant. Is state data up to date? Maybe someone will double-check your work, but they are using out of date data. Why you can do it. Curriculum Vitae (CV): detailed, multiple pages. Might need a table of contents. There might be rules that the CV has to be customized for every grant. Prove that you handled money and didn’t go to jail. The NEA Foundation will match up to $250 per NEA member. Look for partner opportunities specific to your state. Disney Friends and Family will match up to $500 if your project mentions Disney. Get your friends to donate $5 so it doesn’t look like you have no donors to start. http://www.adoptaclassroom.org – requires you to send thank you notes. International Literacy Association grants – some years they have had 0 applications. http://getedfunding.com – search tool for finding grants. http://techlearning.com has an annual report of annual grant opportunities. I couldn’t find the link. Organizations that have trouble finding people to take their money. Sprint will offer 4G service to K12 students who don’t have broadband service. Do: read closely what you can pay for an how much, especially funds for meals. Don’t: spend grant money on alcohol. Do: find out if training requirements meet contract. Do you need union approval? What were the barriers to success? Keep detailed records of spending. Set up an evaluation timeline. Write thank you letters, and get students to write them to! Share what you learned with others. These are my notes from the “Makerspace-in-a-Box” session at the 2016 FETC conference. We have always been makers. Build your inner-duck. No too are alike! If all projects are the same, you have taught your students a recipe. This comes from telling students exactly how many slides to have in their PowerPoint. They created a series of boxes. Each one has materials for 1 or 2 challenges. Directions in included in each box, or students can access online with a QR code. We used conductive foil that was adhesive on one side so we could tape a circuit onto a piece of paper. Diagrams showed how to create different circuits, such as an LED light that had an on and off switch by folding the paper over two sides of a battery. We hooked wires to conductive dough to make a circuit. We were able to power some LED lights and an alarm, but my group was not able to get the spinning motor to work. Lighting up a squishy circuit. The MaKey Makey kit includes wires and a board with an USB port that can be connected to a computer. The computer adds the USB device as an external keyboard, so that the wires are mapped to keys. I was able to make a simple piano by plugging the wires into some fruit. We poked the wires of an LED light through material to a battery to create a simple wearable circuit. Some people used conductive thread to make wearables with an on and off switch. These are my notes from the “Building a Blended Learning Toolkit” session at the 2016 FETC conference. Students can review what happened in class. Give every access. Teachers need to learn how to get the technology work for us. Can incorporate all of the stakeholders, including parents and administrators, so they know what is happening in your class. Looks like a slideshow of static images. Can post a question for the students to respond to. Presenter is able to select specific responses from a list to post on the screen. A slide with images of computers, tablets, cell phones etc., directions say to circle the devices you use most with students. Create reports of how students responded to questions. (Also, she was able to embed a pdf in the presentation.) Display a pie chart of the results to students. Can send links to students that automatically open on their device. Or just make links that students can click on. Asynchronous – students move at own pace. Create simple slideshows. One theme per presentation and a short list of slide layouts. Search for a Creative Content image within app to embed. $5 a month for educators. Whiteboard app, turn your iPad into a smartboard. Whiteboard app, but geared toward making a screencast. Great way to have students explain their thinking. App that can replace using an Apple TV for Airplay. Mirror any device onto a Mac or PC. How to make all of the tools work together. Drag and drop elements to create a web site. Easily embed images from Getty Images. Look for the embed symbol </> to insert embeds from other sites, such as embedding a Nearpod. Type of learning management system, similar to Schoology or Moodle. A few days ago, I wrote about batch converting video files using ffmpeg. A few days later, I faced a similar problem of needing to convert a directory of .html files. “Need” is perhaps too strong of a word. I was experimenting with how to save pages from a PBworks wiki. PBworks allows the user the download a .zip file of all of the pages from a wiki. My downloaded backup contained 44 .html files, many of which were nested into subfolders. Instead of figuring out to recursively loop thought the subfolders, I used a find command, which searches subfolders by default. In my script below, the find command is inserted using command substitution. The converted files are saved to the original subdirectory, keeping .html in the filename, but adding .md as the file extension. I tried out two scripts to do the text conversion. First, I tried html2text, which worked great. Out of curiosity, I also tried using Pandoc. I ended up preferring how Pandoc formatted the final Markdown text. However, one feature of html2text I liked was the option to use --ignore-links, since most of the links were relative to the PBworks domain and would be broken when used offline. I decided it might be useful to see where the original link pointed to, so I decided to skip the --ignore-link option. Line 6 is necessary so that the script will work with filenames that contain spaces. The trick, as suggested in a Linux forum, is to set the internal field separator not to use spaces. Recently, my wife had students in her library create Photostory projects. This wasn’t her first choice of applications for a student project, but the Mac lab was in use for testing. Photostory outputs .wmv files, but my wife wanted to be able to merge the files using iMovie so that teachers could cue up one movie on their classroom presentation stations, which are Macs. My wife thought she would need to use a service such as Zamzar to convert the files from .wmv into a format that iMovie could import, which seemed like a tedious, impractical task. I thought that perhaps ffmpeg, a command line tool, could help. Thus, using wmv-convert * would loop through all of the files in a directory, converting all .wmv files to .mp4, while keeping the same base filenames. Each file took several minutes to convert, but I was able run the loop during dinner. Then my wife was able to merge the files using iMovie later that evening. Just giving people devices has a really horrible track record. You really have to change the curriculum and the teacher. And it’s never going to work on a device where you don’t have a keyboard-type input. Students aren’t there just to read things. They’re actually supposed to be able to write and communicate. And so it’s going to be more in the PC realm—it’s going to be a low-cost PC that lets them be highly interactive. I agree with the first part of his statement because the curriculum and pedogy need to change to make any technology worthwhile. However, he is wrong about the need for keyboards. My middle school students have done complex work on our iPod Touches, such as creating documents that use desktop publishing skills involving typing, creating charts and inserting images. Due to Apple’s intuitive software design, students are quickly able to get past the lack of hardware keyboard. Moreover, they don’t necessarily see the lack of keyboard of as a limitation. Since a third of their lives have been dominated by touch devices, they don’t see keyboards as a prerequisite for using a computer.